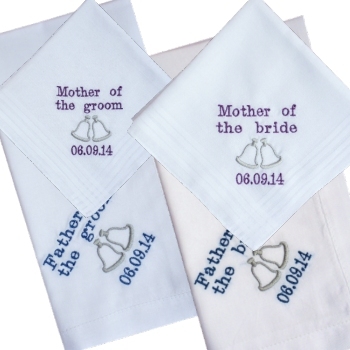 Four cotton wedding handkerchiefs for Mother of the Bride, Mother of the Groom, Father of the Bride and Father of the Groom. All four hankies embroidered are standard classic all cotton hankies, two ladies size and two mens size. Just fill in the option box with your wedding date in number format.